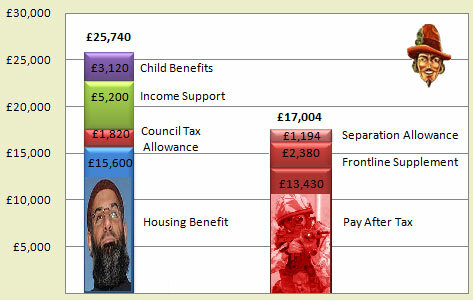 Here is another evidence-based chart you won’t see elsewhere; it shows how much taxpayers are forced to give to Anjem Choudary – the extremist cleric who wants to lead a protest march through Wootton Bassett. He claims £25,740 in benefits to subsidise his hate preaching. Guido questions how he can be seeking work when he spends all his time rabble rousing in broadcast studios and on demonstrations. In contrast a frontline soldier, fighting Choudary’s taliban allies in Afghanistan, takes home £17,004 for risking his life. If that private is killed in combat, his widow and children would have to live on a pension less than Choudary gets.